Dantrium (Dantrolene) is a muscle relaxant, which is widely used to treat or relieve muscle spasms occurring in patients affected by cerebral palsy, multiple sclerosis, injuries to the spinal cord or other causes. Dantrium (Dantrolene) is a muscle relaxant, which is widely used to treat or relieve muscle spasms occurring in patients affected by cerebral palsy, multiple sclerosis, injuries to the spinal cord or other causes. Medical experts believe it works by interfering with nerve signals in the muscles, which results in the muscles relaxing, thereby causing a reduction in spasticity. Another use for this drug is preventing or treating a condition called malignant hyperthermia, a condition which can occur as a result of anaesthesia. 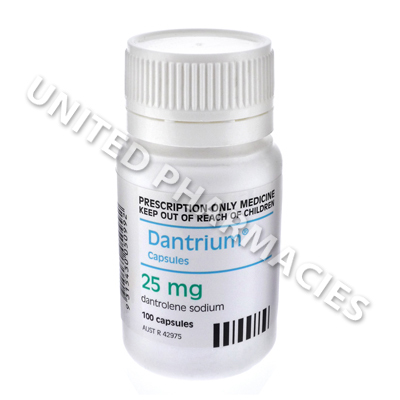 The dosage prescribed to adult patients taking Dantrium (Dantrolene) capsules depends on the condition requiring treatment. Doctors often instruct adults taking this drug to prevent malignant hyperthermia to take 4mg to 8mg in 3 to 4 doses, for 1 to 2 days before surgery is due to commence. The last dose should be taken 3 to 4 hours prior to surgery, and the patient should take it with just enough water to swallow the capsule. Dosage regimens for chronic spasticity are different. Patients may be told to take 25mg once per day for 7 days. The doctor may then instruct the patient to take 25mg 3 times per day for another period of 7 days. After this, it may be increased to 50mg 3 times per day for 7 days, after which the patient may be told to take 100mg 3 times per day. However, if the condition can be controlled on a lower dosage, the doctor will tell the patient not to increase the dosage. Inform the prescribing doctor about any side effects which occur. A small number of patients may experience a serious reaction. You need to see your doctor straight away if you notice appetite loss, coughing up blood, seizures or any other symptoms of a severe reaction. Severe and potentially fatal liver problems may occur in rare cases. This is more likely in patients who are taking higher doses, or are female and over 35, or if other medicines are being taken. Regular liver tests will be required by your doctor, and it is essential that all scheduled medical appointments are attended. Light sensitivity may occur in patients taking this medicine. Doctors advise avoiding sun exposure and tanning booths. Always use Dantrium (Dantrolene) as you have been prescribed by your doctor. Never self-medicate or change your dosage without first consulting your doctor. The correct dosage can vary depending on your health, medical history, and the severity of the condition being treated.